Spoilt ballot results: the 2015 UK General election. ● 66% of registered voters voted, just 1% up on the 2010 election. ● The biggest winner in 2015 was an invisible silence. A third of registered voters didn't vote (nearly 16 million!). ● The Conservative government was elected with the support of less than a quarter of registered voters. As always, democracy only enables change if people use their vote. Without that, there's no evidence that people even want change. For the 2015 results in detail, see the links below. How many voted for NONE and otherwise spoilt their ballots? 'Spoilt' or 'spoiled' ballots were reported to be the 13th largest category among the votes cast (Conservatives top, Labour next, etc.). However, across the UK, they represented less than 1% of votes. So they were not newsworthy. ● A report, for example, from Northern Ireland showed that spoilt ballots beat a candidate in eight constituencies. ● In both Cumbria and in Buckingham the elected candidate addressed the significance of over 1,200 spoiled ballots in their acceptance speeches. 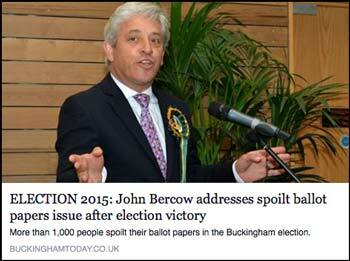 This shows that when the number of spoilt ballots becomes significant, it demands a response. 1) Clear votes for NONE were observed by observers of the election counts. Those clear votes for NONE now make it indefensible for the Electoral Commission to continue to classify protest votes as 'voter intention uncertain'. 2) As in those Northern Ireland constituencies (above), in David Cameron's own constituency and elsewhere, the spoilt ballots beat the votes for several other candidates. Yet in each constituency, and nationally, the BBC chooses to report the votes for all candidates, and ignore the sometimes larger number of votes for None of the candidates. Clear votes for NONE make it indefensible for the BBC and other media to ignore protest, and dismiss protest votes as 'uncertain'. But things will only change when votes for NONE are clear, and in large numbers that make them newsworthy. If just some of the silent 34% Vote NONE this time, then the protest for change could be the biggest ever public protest in UK history. It would show the reality that the government represents less than a quarter of the country. So if you want none of the parties, Vote NONE in the 2017 election. Establish the right to say NO, as well as YES, to UK politics. Next: Example 'Declaration of results' reports from 5 constituencies.